Daily Express - 3000 a month dying from dehydration ! 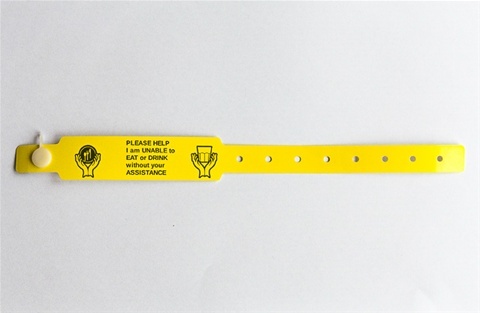 This vinyl wrist band ( similar to some hospital bands ) has been designed to highlight patients who may be at higher risk of Dehydration/Malnourishment due to certain conditions. My band has just been granted Design Right Protection by the Intellectual Property Office (Design No.4042554). Through my position I am contacted by so many concerned relatives who have witnessed their loved ones not being supported with food and fluids. This is not only in Hospitals or Care Homes but also those living independantly relying on carers to go in and prepare meals. I have recently witnessed this myself when one of my own clients went into hospital. Often I saw she had food and drinks that were just left in front of her untouched. Out of desperation from this ladies family and also my own frustrations, I decided something needed to be done in highlighting awareness to staff. All staff need to be able to recognise patients needing assistance who are unable to speak for themselves. The band is easy to read. Staff can easily recognise those at potentially higher risk from dehydration. Agency staff who dont know the patients history can easily identify without reading notes for each patient first. As staff are sometimes borrowed from other wards, (working without handovers) they too can see straight away who needs assistance. Home Care Agencies, rarely do the same staff go in each time all week. If they see a patient with this band and do not look in the notes they can see quickly this is a person to assist, not cook a meal and leave it in front of them. 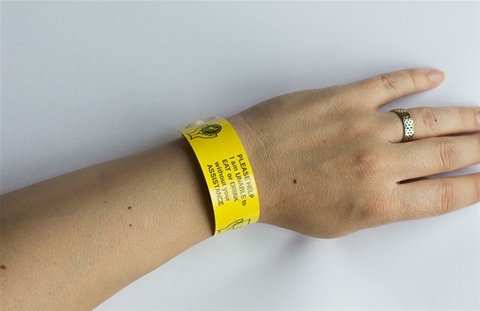 People on entering any hospital/ care setting are normally allowed to wear things such as these, unless there is a very good medical reason for it to be removed. For bulk orders please email on snowdropcare@sky.com for discount.